Radius is a small 3-way-shelf-speaker. It is developed by Thomas Schmidt. 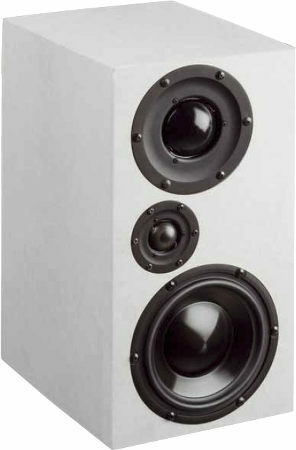 Radius is a bass reflex speaker with Morel drivers: a dome midrange Morel EM-1308, a Morel woofer EW-638 and a tweeter ET-448. It is a bassreflex loudspeaker. The crossover consists of 2rd order filters (12 dB per octave slope). The frequency response is quite flat, the harmonic distortion is low (less than 0.3% above 500Hz at 85 dB (1m)). The decay spectrum shows a small resonance at 500 Hz; apart from that it is without any fault. "With the tweeters placed outwards and the loudspeakers aligned parallel to the side walls the end result is an impressively broad sweet spot, so that even three people can experience an almost identical frequency response on the couch. This is accompanied by a very stable and natural spatial representation that makes listening to music a real happening without straining the listener in any way. Even when placed free-standing, the pronounced upper bass of the Radius produces so much pressure that there is no desire for more bass. Close to the rear wall and at shorter listening distances, the closed version is the more honest version of the two. You can hear that these drivers are real experts in their dedicated ranges. The sum of the parts results in a really supreme loudspeaker that, when care is taken to position them correctly, will be able to reveal their full potential to a bigger audience." Our high-end version employs Mundorf copper foil coils or ClarityCap capacitors of type MR in series to the loudspeakers. Elsewhere baked varnish air core coils or ClarityCap PWA capacitors are used. Our high-end version employs Mundorf copper foil coils or Mundorf EVO Silver Gold Oil capacitors in series to the loudspeakers. Elsewhere baked varnish air core coils or Mundorf EVO capacitors are used.